In this book, straight A student, Cambridge graduate, experienced teacher and former A Level examiner Lucy Parsons gives you a complete formula for getting the top grades every time. Starting with unlocking your motivation and fixing your exams mindset, she guides you through a practical system that will reduce the overwhelm, banish procrastination, give your life balance and empower you to work towards your exams in a methodical and low-stress way. Are you struggling to get motivated to study for your exams? Do you find yourself procrastinating on a regular basis, spending too much time on your phone and not enough on your studies? Are you struggling to find revision techniques that work for you? Are you stressed out about having too much to revise in too little time? Are you struggling to improve your grades despite doing dozens of past papers? If you answered yes to any of these questions then The Ten Step Guide to Acing Every Exam You Ever Take is the book for you. “Whatever level of education you are in, whatever subjects you are studying, if you follow Lucy’s steps and implement her methods it will totally alter your way of thinking and attitude towards work, but not least your grades and academic success. My grades are proof; I got a sheet of paper last August telling me I had achieved 10 A*s and 2 As in my GCSEs.” Laura-Jane Baxter, A Level student. 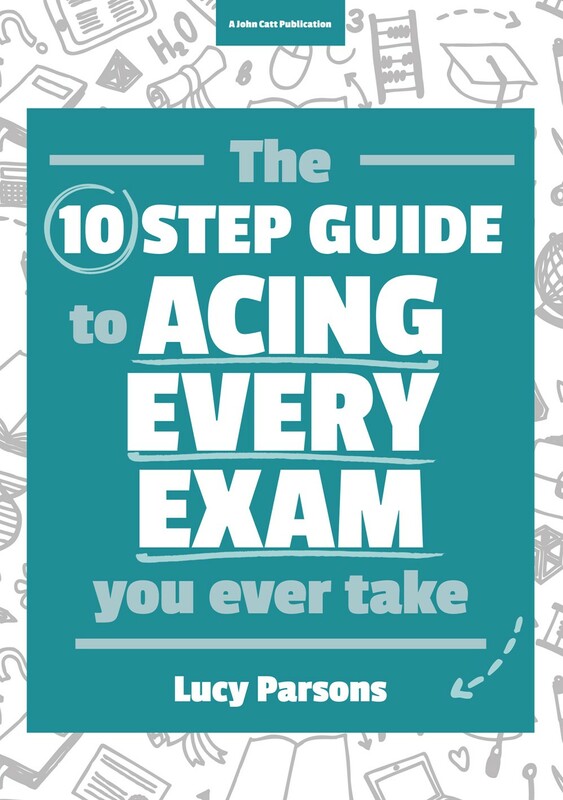 “Before I read The Ten Step Guide to Acing Every Exam You Ever Take I had virtually no idea how to revise or study for myself given that I was mostly spoon-fed material at GCSE and did virtually no revision for my GCSE exams. The book pointed out how vital organisation is to success, and as a result inspired me to purchase organisation materials, such as calendars and planners, which I use frequently and have seen results with. It also showed me many ways I could revise and study successfully, most of which I had never thought of before.It also helped me prepare for A-level as it mentioned making sure to work from day 1. Doing so has allowed me to see how much better and faster I understand things, rather than learning later from botched notes during revision time. My favourite thing was the 40 revision methods, as they helped me figure out how I could go about independent study and revision. Thank you for the help you are providing to students. I know that I in particular would be lost without the organisation tips and revision tips provided in your book.” Paige, A-Level Student. “Before I read The Ten Step Guide to Acing Every Exam You Ever Take I was finding it difficult to know where to start. It gave me ideas of new ways to study rather than just sitting down and reading from a textbook. It helped me to plan out my revision and life using the revision timetables and the sample copy. It helped me to manage what I need to improve on (I found the strengths and weaknesses table very useful!). My favourite thing would be the different ideas and resources.” Molly, GCSE student.